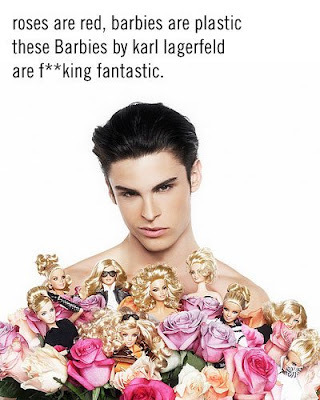 As a little birthday present to Barbie, who turns 50 this year, Uncle Karl Lagerfeld has styled the girls for their big day with hot model Baptiste Giabiconi posing as Ken. Karl never ceases to amaze. As an 8-year old, having dreams of becoming a hair stylist, I gave my sister's Barbies (ALL of them and her Honey West doll too) a weekly haircut. First the "layered" look, then "feathered" a la Farrah and finally they all went "butch" when I gave them crew cuts. I guess I didn't realize that the hair wasn't going to grow back. Anyhoo, see more of more of the Kaiser's pictures at Nylon and OohLaLa. Is that a Haiku? I LOVE it. and i love lagerfeld because he's cool ... innately so. when you're cool you don't have to worry about getting older ... it kinda sorta protects you. And Paul, wow...I never thought of coolness in terms of protection... but that is so true! love it.